Science. It’s a wonderful thing. And if there’s one thing we’ve learned from the cigarette lobby – it’s that you can use “science” as a tool for anything. Tobacco is definitely harmful. But many people have been told, for many years, that caffeine is almost as bad for you. But it’s not. Though you can take these results, like a bitter cup of coffee, with a grain of salt. What we’re really looking at here is the health benefits of caffeine consumption. Coffee itself has many psychological benefits. Because it tastes nice, and is a pleasurable experience. But we’ll largely ignore those. You might have been told by all sorts of killjoys, and naysayers, that caffeine is bad for you. Well here’s the almost irrefutable proof that it isn’t. So tell them where to stick their cup of bad advice (see the bonus item on the list) while you enjoy your next cup of caffeinated goodness. 1. Caffeine is good for your heart. In a study published this week in the American Journal of Cardiology an Israeli medical team have discovered that caffeine (three coffees a day worth) is good for the heart. It stops heart attacks and strokes. This study is not an isolated case – it follows a string of recent studies that have downplayed previously held convictions about coffee being bad for one’s heart. An American study of almost 60,000 Finns aged 25-74, published in January 2011, found that caffeine consumption didn’t increase the risk of heart failure. And a German study from April 2010 found drinking between four and eight cups of coffee a day improved one’s cholesterol. 2. Caffeine is good for your head. The effects of caffeine on the brain are well documented. And we’ll get to the issues of memory and Alzheimer’s in a minute. But it seems caffeine consumption will also help prevent the development of nasty head cancers. Scientists found that five or more cups a day can significantly reduce your chances of developing a nasty head/spine tumour called glioma, at least according to a combined study between researchers from Harvard and the Imperial College, London from January 2010, which found tea and coffee can reduce the risk of developing the cancerous tumours. Caffeine will also significantly lower the potential development of Parkinson’s Disease, see this study relating to Alzheimer’s that references the Parkinson’s/caffeine relationship, and this abstract for another study. 3. Caffeine is good for your memory. Caffeine can help your memory if you’ve got a normal, fully functioning, brain. And it’ll also, apparently, stave off the onset of Alzheimer’s Disease. This edition of the Journal of Alzheimer’s Disease is available in full on the web, and is devoted to the relationship between caffeine and the brain. This Science Daily article offers a summary of the findings in that journal. 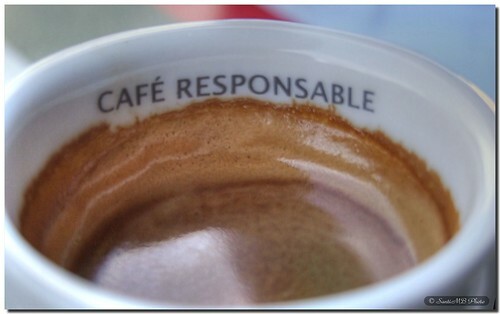 Caffeine does not usually affect performance inlearning and memory tasks. Occasionally, caffeine effects on memory and learning, facilitatory or inhibitory, were found. These effects were rather the result of complex interactions with dose, subject, and task variables. They may result from effects on encoding, or attention devoted to the information, rather than being direct and speciﬁc effects on the storage or retrieval ofinformation in short-term and working memory. Caffeine can apparently improve performance directly over a wide variety of mental tasks, and indirectly by reducing decrements in performance under suboptimal alertness conditions. 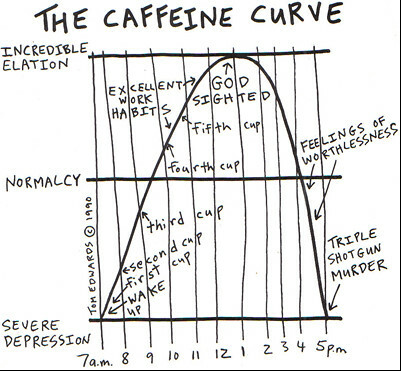 The efﬁcacy of caffeine under states of reduced alertness is quite consistent. Translation: Caffeine will help your brain function when it’s tired. Better news, if you’re trying to justify your coffee habit, is the research into degenerative brain disorders. Another article from the same journal quoted above came up with a slightly different finding. Again, the take home message seems to be coffee will bring you back to normal from an abnormal spot. Which is a good thing. Better to be normal than sub-normal. This actually meshes nicely with another study into the stimulating effect of caffeine, which found that after an initial high when you first start drinking coffee, your morning coffee returns you to a functional baseline (ie treats withdrawals) rather than actually perking you up. Although, yet another article from that journal waxes lyrical about the benefits of caffeine consumption. It deals more specifically with caffeine’s effect on synaptic plasticity. Here’s another article that looks at caffeine and dementia. Again. Finding that caffeine protects your brain. So it’s good for your head. Ok. Onto the next bit of the body. Did you know that drinking coffee, at least if you’re Japanese, seems to reduce the risk that you’ll develop cancer in the throat area. 5. Caffeine is good for your energy levels. Everybody knows this. Olympic athletes aren’t allowed to have too much caffeine in their blood, and a whole industry exists to pump youngsters full of the stuff. The bad news is that the best results, performance wise, come when you consume pure caffeine, not coffee. 6. Caffeine is good for your gall bladder. From what I can tell, this one is a little in dispute. But a study published in the Journal of the American Medical Association in 1999 found that caffeine is an effective prevention method for gallstones. And who wants those. 7. Caffeine is good for your lungs. Well. Especially if you have asthma. According to a couple of studies anyway. The first one found that caffeine improves lung function in asthmatics. The second, that caffeine acts as an asthma preventer. 8. Caffeine is good for your pain. This is true in a couple of ways. Firstly. Caffeine helps post exercise recovery. So says a study by University of Georgia researcher Victor Maridakis (see this abstract for the paper published in the Journal of Pain). This confirmed the findings of an earlier study, published in the same journal. Which found that when a bunch of teenage males were asked to engage in a spot of cycling the post-exercise pain was reduced when treated with caffeine. Another study found that caffeine and ibuprofen are the best combined treatment for headaches. And not just caffeine withdrawal headaches. Tension headaches as well. 9. Caffeine is good for your liver. A study found that coffee – not just caffeine – has a positive impact on the health of your liver. Especially in the prevention of cirrhosis. So if you’re an alcoholic – it pays to have a simultaneous coffee addiction. And. Another study found that drinking 2-3 cups of coffee a day will significantly reduce the chances you have of developing liver cancer. And that can only be good news. 10. Caffeine is good for baldness. Well. Not that sort of baldness. Here’s the abstract for the study. We’re talking about people suffering from Androgenetic Alopecia (AGA), which is the fancy name for run of the mill male pattern baldness. Androgen-dependent growth inhibition of ex vivo hair follicles from patients suffering from AGA was present in the human hair organ culture model, a constellation which may serve for future studies to screen new substances against androgen-dependent hair loss. Caffeine was identified as a stimulator of human hair growth in vitro; a fact which may have important clinical impact in the management of AGA. 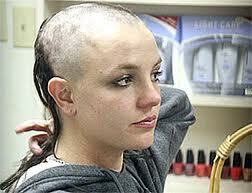 Some of the reports I read suggested for best results the caffeine needs to be massaged into the scalp. 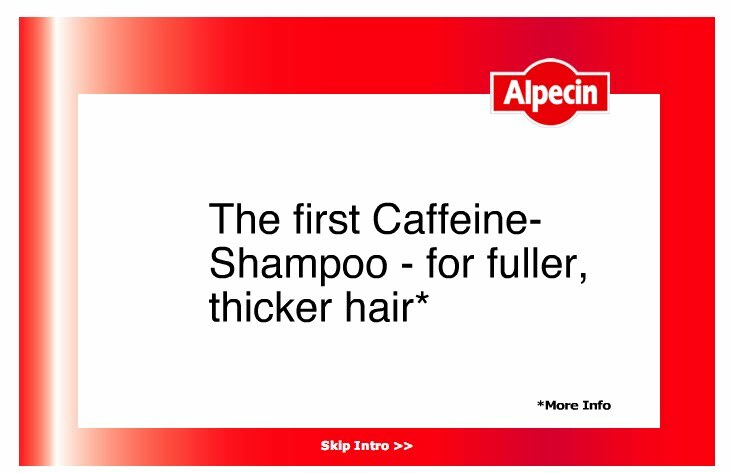 And the good news is that you can buy some caffeine shampoo. Bonus: Decaff is good for your colon. An Oxford study found that decaff, quite appropriately, is only really good for looking after your rear. Coffee is good for you. Don’t let anybody tell you otherwise. 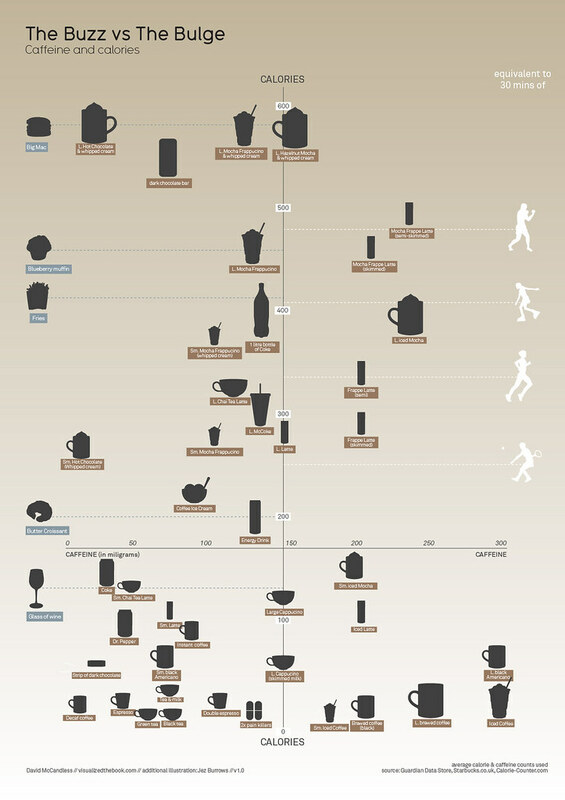 And here’s a pretty good little visual reminder of where coffee sits on the calorie scale too, in case you need any ammunition to throw back at your critics. I knew the bit about the headache!! thats how I fix my headaches!! also, straight after drinking the coffee and taking the tablet i let the effect of the wram milk lull me into a 20min ap, after which time both the caffeine and the drugs have had time to take effect and I am not only refreshed from the nap, my headache is gone and I have been invigorated by the coffee…. its fantastic!! everyone should try it! Just don’t put 6 sugars in each coffee like my colleague does. In fact, don’t put any sugar in it. [WORDPRESS HASHCASH] The comment’s server IP (173.236.242.116) doesn’t match the comment’s URL host IP (67.205.3.35) and so is spam.